Release: 2012 - 16 tracks - LIve recording. "This is the perfect album to listen to on a late summer afternoon"
"...If you missed Benoit Viellefon’s festival show, you missed a treat. - We’d all be much happier if Benoit’s music was the soundtrack to our lives." “It’s okay, you can keep talking…” delcares an affable Benoit at the beginning of this live recording. The man’s safe in the knowledge that his band’s sweet’n'sassy brand of gypsy jazz ( mixed with a whole host of other aural flavors ) will be impossible to ignore once they really get going. With a set list that includes All Of Me, Django’s Minor Swing, as well as five originals written by Monsieur Viellefon himself, this record will effortlessly sweep you away on sonic gossamer wings to the happy, happy place of your choice. Djangophile Daper dans get Battersea swinging. 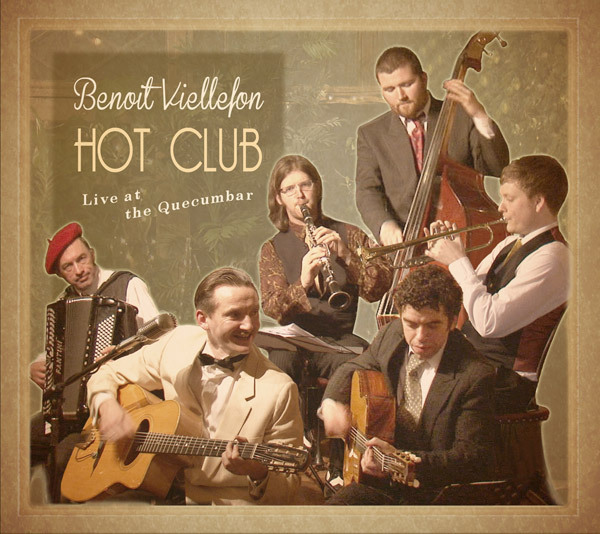 Benoit Viellefon is a 30-something French guitarist who resided in the UK. Viellefon is a dapper dresser – his look is that of an entertainer from the pre-rock’n'roll era( bow tie and tux )- and his sound is inedebted to the gypsy jazz that Django Reinhardt created in the 1930s Parisian clubs. His hollow body guitar rapidly strums a fluid rhythm while other instruments breathe melody into the music. Accompanying musicians include very gifted accordion and clarinet players, trumpet saxophone, double bass and guitar. Viellefon and band to to bring together a variety of pre-World War II music forms- bal musette, chanson francaise, Russian folk, even a subtle Latin American rhythm – carefully weaving the different styles together. They always keep things swinging and good humoured. Originals such as “More Money” and “My Dog Is a Gypsy” are pleasant confections while standards like “Minor Swing” and “All Of Me” are handled confidently. There’s nothing new here but this live album – recorded at Battersea’s music bistro Le Quecumbar ( listen and buy the CD ) - is very enjoyable.